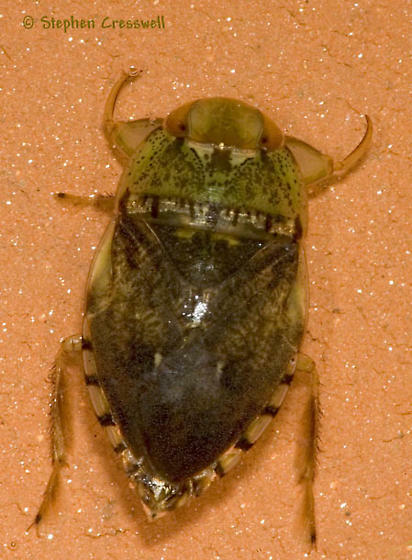 Here's a Creeping Water Bug to go along with the Crawling Water Beetle I just posted. Hooray, a new family for BugGuide. Just look at the biceps on this big bruiser! Genus is Pelocoris. My friend has gone collecting in Arizona for a month the last two summers, and he's gotten tagged by cacti, stung, bit, you name it, but he said the most painful thing that happened to him was getting bitten by a Naucorid. Not what I would've expected from such a cute little thing!